Superman. That one word brings up iconic images of the superhero in the red and blue suit, saving the day. But have you ever wondered where he began? I certainly haven't, maybe because I'm not a fan of comic books or superheroes. 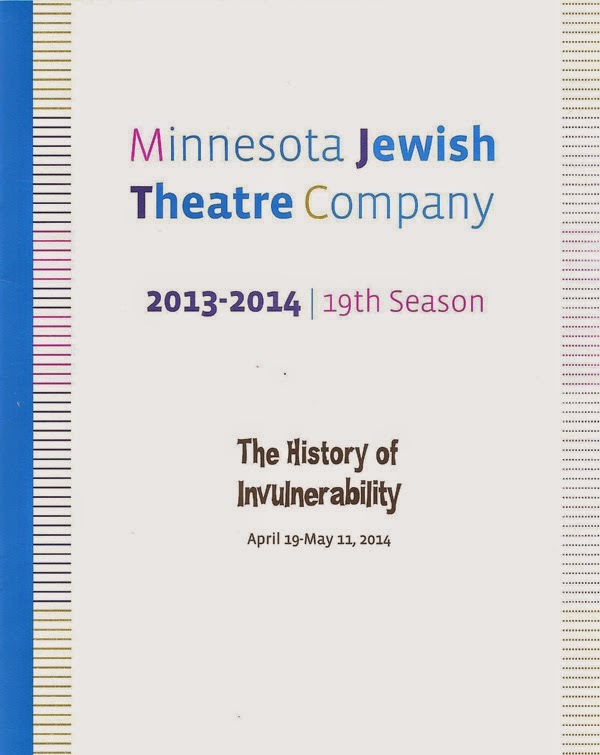 But you don't have to be a superhero superfan to enjoy Minnesota Jewish Theater Company's play The History of Invulnerability (although it probably doesn't hurt - I saw more young men in the audience then I've ever seen at the theater). 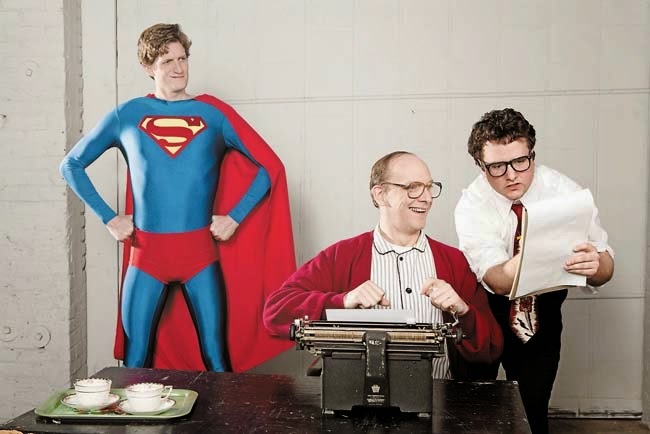 The play is a fascinating look at the question of Superman's origin, telling the story of Jerry Siegel, who created the legendary figure along with his friend Joe Shuster. It's a relatable and very human story about art and creation, success vs. failure, and a man trying to make a life that he and his family can be proud of. The History of Invulnerability plays out as a deathbed fantasy of Jerry Seigel's, as he's visited by his creation in his final hours. Jerry and Superman himself tell us this tragic story, in which Joe and Jerry created the character in the 1930s, struggled to find a publisher, signed away their ownership rights, watched Superman's rise in popularity as they were pushed out of the creation of the comics, unsuccessfully sued to have their rights restored, and were forced out of the comic book business. They both struggled for years, and it wasn't until the 1978 movie that they were able to use public support to get some kind of recognition and remuneration from the owners of Superman. The play is really about one man's struggle with his creation, coming to terms with what it has become and what he has sacrificed over the years, and for what purpose? As a child of Jewish immigrants writing in the late 1930s, Jerry was greatly affected by what was happening to European Jews, and perhaps used the comic as an outlet - a strong and powerful man standing up for the powerless and the oppressed. Playwright David Bar Katz shows us Jerry's story interspersed with the story of prisoners in a concentration camp, including a young boy who believes that Superman will come to save them. Unfortunately not even Superman could stop the atrocities perpetrated by the Nazis, and the play ends in a shocking scene as neither of these two parallel stories have happy endings. The comic book nature of the story is cleverly used in the production. Cartoons (drawn by Sam Smith) are projected on a screen at the back of the stage to set the scene or illustrate what is being discussed. On several occasions, the cast acts out comic book scenes, creating perfect tableaux in freeze-frame sequences. And the cast does a fine job bringing these and the more sober scenes to life. As Jerry, the always wonderful Jim Lichtscheidl is a sympathetic everyman who just happens to have created the most famous superhero in the world. Dan Beckmann makes a convincing Superman, with perfectly coiffed hair, feet planted widely, shoulders back and chest out, hands firmly on hips. The dozens of other characters are bought to life by the ensemble which includes Alex Brightwell (Jerry's partner Joe and his son), Charles Numrich (the bad guy comic book publishers), Dustin Valenta (a touching performance as the boy in the concentration camp), Joanna Harmon (Jerry's mother and the model for Lois Lane, whom Jerry eventually married), and Maggie Bearmon Pistner. *The Hillcrest Center is under construction so it's a bit of a mess. Tip: drive around behind the baseball fields and park opposite the playground. The path through the playground leads to the lower door of the Center, from which you need to find your way up the stairs to the theater.